This deluxe illustrated journal by renowned spiritual teacher and bestselling author Alana Fairchild is your key to connecting and working with the energy of Kuan Yin, the beautiful sacred rebel of the East. This oracle-journal is filled with the teachings of Kuan Yin to help you nurture your connection to this extraordinary Buddhist goddess. 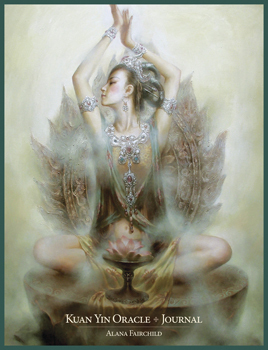 The 44 exquisite art reproductions of Zeng Hao interspersed throughout offer powerful visual depictions of Kuan Yin to help you tap into her sacred healing energy and explore her teachings through writing. Features premium quality, cream-colored, wood-free paper and a combination of lined and unlined pages. Deluxe paperback journals measure 7 in x 9 in with 220 pages.